How does one stop child trafficking if everyone, the child included, finds it perfectly acceptable? Fifteen-year-old Celestin Ahouandjinou has never understood why trafficking is considered a bad thing. For five years, Celestin worked in a stone quarry in Nigeria, crushing stones into gravel with a hammer, sifting it and shovelling it onto trucks. He worked six days a week and lived on maize flour porridge. He caught rats and mice for meat. Yet he panicked when Nigerian police sent him back to his native Benin. “I wanted to stay,” he said. Celestin said he went to Nigeria with the consent of his parents. He worked for a relative who had taken him there, a man he addressed as 'patron', or boss. Stories like these are rife in Zakpota, a farming community of scattered villages two hours drive from the port city of Cotonou. Zakpota comprises 56 villages and a population of some 90,000. Most of the people there depend on subsistence farming. In December 2003, Zakpota was at the heart of a vast child trafficking scandal. It erupted after rival traffickers showed the Nigerian police pictures of children performing hard labour in quarries and farms in Nigeria. The police loaded 261 boys on trucks and sent them back to Benin, where they found temporary shelter with relief organisations before returning to their villages. Aid workers said several hundred other boys returned independently from Nigeria at about the same time. Seven traffickers were arrested and sent to prison. Nearly all the boys, who were aged from 6 to 16, came from the Zakpota region. They had been trafficked to Abeokuta, the capital of Ogun State, 100 km north of Lagos, by relatives with the consent of their parents. Their dreams were modest - for a new radio, a bike, or a pair of trainers. And they were ready to work for years in near slave conditions to be able to afford such luxuries. Nigeria is small Benin’s powerful and relatively wealthy neighbour. Beninese of all ages believe they can make a fortune there. The boys had to work two full years before they were allowed fifteen days off, in three successive cycles. They lived in makeshift camps next to the quarries and were left to fend for themselves. Maybe once a week, the boss would come and collect the money the boys received from gravel buyers. The 261 boys were believed to represent only a small percentage of the total number of children trafficked to Nigeria. Fourteen months on, hundreds of Beninese boys are still performing hard labour in the quarries of southwestern Nigeria, relief workers and traffickers told IRIN. “There are probably more boys now than there were before,” said Olivier Feneyrol of the Swiss relief agency Terre des Hommes. Some 50,000 Beninese children are believed to be a victim of cross-border child traffic in other West Africans, according to UNICEF. 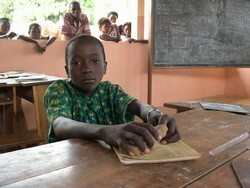 Benin has a particularly acute child trafficking problem due to its so-called ‘vidomegon’ tradition. For decades, children from poor families were habitually sent away to live with better-off family members. It was considered honourable for well-to-do families to take poor young relatives under their wing and provide them with food and schooling. The children, in turn, were expected to help in the household. This patronage system sprang from mutual solidarity and lightened the burden of child rearing for those who were destitute. Vidomegon literally means ‘placed children’. But in the country’s poorest regions, the tradition has become pure business, and a socially-acceptable business at that. In arid and impoverished Zakpota, the production of maize, manioc and cotton has plummeted over the years. Many farmers find it difficult to feed their children. Benin’s population growth exceeds its economic growth. The average woman bears 5.7 children, according to the United Nations Human Development Index. But as in so many other regions of Sub-Saharan Africa, the average farmer is poorer today than he was a decade ago. So when parents have too many children, they place them in the care of a trafficker, Feneyrol said. The traffickers are respected members of the community who know the farmers well and make them promises of wealth. Feneyrol said the seven traffickers who were arrested in December 2003 had all been released. “We happened to be there when one of them returned to his village. The village elders staged a welcome ceremony in his honour,” he said. International relief organisations such as Terre des Hommes and the International Red Cross are putting dozens of boys through school who used to work in the quarries. Some boys, like Celestin Ahouandjinou, are learning a craft. Ten-year-old Bonaventure Fon worked for two long years on a manioc farm in Nigeria. He told IRIN he had begged his parents for permission to leave after his oldest brother returned from a stint working there with a brand new radio. [Benin] Ten-year-old Bonaventure Fon worked for two long years on a manioc farm in Nigeria. He begged his parents for permission to leave Benin after his oldest brother returned from a stint working abroad with a brand new radio. February 2005. Everybody in Zakpota seems to know the extraordinary story of the 14-year-old boy who, after four years in the stone quarries, had not only been able to repair the leaking roof of his father’s house, but had also built a small house for himself in the family compound. Farmer Bernardin Awonon readily admits that he ‘gave’ two of his sons to a trafficker. When he was young, he himself worked for 17 years on a palm oil plantation in Nigeria. He returned to Zakpota to take care of his elderly father. He now has seven sons, three daughters and a dry patch of land. “My sons put some money together to buy a drink for me. In our culture, that means that somebody has something very important to say. They pleaded with me: let us go with him to Nigeria. I knew I could not stop them,” he said. The Benin government is preparing a law to ban child trafficking. In cooperation with the United Nations Children's Fund (UNICEF), the government has set up village committees to stop child trafficking. But government officials told IRIN privately that this would remain an uphill struggle so long as parents see no harm in trusting other people with their own children. The Brigade to Protect Minors (BPM) has arrested 25 traffickers last year, police inspector Louis Tokpanou told IRIN. But material and staff are lacking. The brigade consists of just 10 officers patrolling over 600 km of border with Nigeria. One former child trafficker confirmed that the trade was continuing to thrive. He did not seem to mind.